It has been nearly seven years since I began writing this blog, and I am beginning to sense the same spiritual unease among people that I experienced then. True, there is a disparity in how the economy of our nation was functioning compared to today; people seem more confident in their economic future. But the civil unrest and disrespect towards our fellow man, although beginning to rear its ugly head in 2011, is now on full display. Then there is the uncertainty of the corruption/hostility within our government, the overwhelming numbers of people trying to cross our borders, and the raging fires and devastating hurricanes -- and it all translates to both anxiety and confusion about the future. In Biblical terms, people are beginning to experience fear. That word "fear" means more than just being afraid or scared. It has connotations of sorrow and grief and dread ... concerning people, things, and events. But it is exactly at these times, when everything around us screams "End Times" that we must remain clear about the overall message of the Word .... we can be assured of God's final victory over the Anti-Christ forces in the world, and His faithfulness to see us be overcomers of this ungodly system. In these times of difficulties, there's a truth that we can cling to. In Isaiah 43, God declares that He is the Savior of Israel, to whom we have been grafted into. His words to His beloved people are true for us, too: Do not be afraid, for I have ransomed you [from captivity]. I have called you by name; you are Mine! Throughout the Bible, God tells us to "fear not" because He knows the Enemy uses fear to decrease hope and limit our victories in Him. But we must never forget that we are a child of an all-powerful, all-knowing, never-changing Father who cares deeply about our life and wants us to walk in the victory His Son died to give us. Remember, He has redeemed us; He knows our name; and He declares to the universe that we are His! Does that mean we won't face trials from an Enemy who wants to defeat us? No. Even Jesus expressed great sorrow and grief and dread as He prayed three times for the cup of agony to be removed, if it was the Father's will. His emotional condition was so severe our Lord sweated blood in the Garden of Gethsemane before His crucifixion. But in that moment, as the gospel of Luke, Chapter 22, tell us, Then an angel from heaven appeared and strengthened Him. In that moment of grief and dread -- and yes, we call it fear -- Jesus felt the powerful presence of God with Him. There was a purpose for Jesus's life and it extended far beyond what was about to happen in this world. It was the power of God's love and presence that transcended what was about to happen in the physical. And it allowed Jesus to endure the evil perpetrated against Him. We must follow in His footsteps. There are incontrovertible truths that we can adhere to that will help us endure our own times of sorrow, grief, dread, and fear. First of all, we know that we are chosen and nothing can separate us from God. We are covered by the blood of Jesus and wrapped in the Grace of God, which empowers us to overcome all that is from Satan. Jesus is our Good Shepherd and will not allow us to endure more than we can stand. We are being prepared to rule with Him in the age to come. If you are suffering the torment of Satan's fiery dart of fear, then you must remind yourself that God's judgments against the world are ultimately to wipe out evil, not harm the saints. Just as He did in the wilderness of Egypt, God will supernaturally protect and provide for us. Our faith demands that we trust Him in this! When the difficulties in this world increase, so will God's guidance and leadership. And should this world result in our physical death, there is no greater joy than knowing that the very next instant we will be in His glorious presence forever! But perhaps you still cannot defeat those demons of fear that have crept into your life. Let me give you some advice that will help you rise above the lies the Enemy is whispering to you. You need to understand that you have a choice ... you can give in to those lies, cowering in fear and powerlessness -- or you can stand and declare that you are walking in your inheritance as a co-heir with Christ, and you are covered by the authority of God who has made Jesus "Far above all principality, and power, and might, and dominion, and every name that is named, not only in this world, but also in that which is to come: And He put all things [in every realm] in subjection under Christ’s feet, and appointed Him as [supreme and authoritative] head over all things in the church, which is His body, the fullness of Him who fills and completes all things in all [believers]". We are quite able and capable of rising to our spiritual potential and strength! When we know what we believe about God and ourselves, then we have the confidence and faith to stand firm and follow Jesus's model of dignity and strength in our hour of need. We will not be afraid to voice our allegiance to Him or to choose to follow Him, no matter the cost. Here's the thing, Jesus never taught on "feelings"; He always commanded obedience. 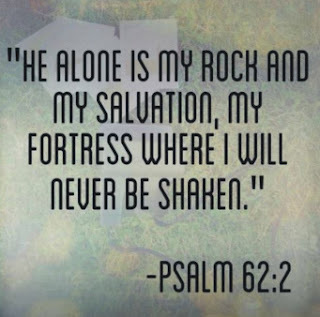 We must truly believe He is our Rock, our Fortress, and our Deliverer; that He is our Strength, our God in whom we can trust. He is our Shield, and our horn (Power) of Salvation. He is our Stronghold and we must praise His Name, for He is worthy to be praised. And we will be saved from our enemies! This is a passage from Psalm 18, and it is a Scripture that is never far from my heart or my lips. I believe these words with all that is in me! So, I encourage you to face your fears and begin to declare the Truth of Scripture -- and believe it! Jesus tells us that we are not given a spirit of fear, but we have the Holy Spirit, who gives us mighty power, love [of God] and self-control. When we recognize the power that is in us, we do not fear anything [or anyone] else. And we have the ability to control our carnal emotions and fleshly behavior, as we walk in our spiritual identity. Fear has no place in the life of a Believer. Trust in God's power inside you and watch Him deliver you of all sorrow, grief, dread, and fear. Then declare that you are ready to walk in the glory of God for the remaining days of your life. It is my prayer that this Thanksgiving, you will find increased faith in the power of our Lord to deliver you from the concerns of this world. Give thanks to our ever-faithful God who never takes His eyes off you. Praise Him for His enduring love! Psalm 34:4 I sought the Lord [on the authority of His word], and He answered me, And delivered me from all my fears.